KBB.com Best Resale Value Awards. Boasts 24 Highway MPG and 19 City MPG! 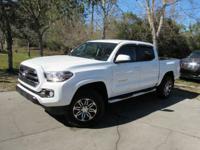 This Toyota Tacoma delivers a Engine: 3.5L Atkinson-Cycle V6 -inc: VVT-iW wider intake and VVT-i exhaust engine powering this Automatic transmission. Wheels: 16/ x 7J+30 Style Steel Disc, Variable Intermittent Wipers, Urethane Gear Shift Knob. * This Toyota Tacoma Features the Following Options *Trip Computer, Transmission: 6-Speed Automatic -inc: electronic shift and gated shifter, Tires: P245/75R16 AS, Tailgate/Rear Door Lock Included w/Power Door Locks, Tailgate Rear Cargo Access, Streaming Audio, Steel Spare Wheel, Sliding rear window, Single Stainless Steel Exhaust, Side Impact Beams. * The Votes are Counted *KBB.com Best Resale Value Awards, KBB.com Best Buy Awards Finalist. 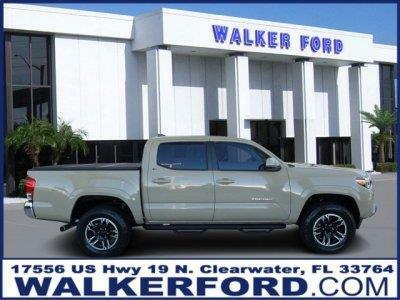 * Stop By Today *Live a little- stop by Walker Ford located at 17556 US 19 N, Clearwater, FL 33764 to make this car yours today! Walker IS Ford! Invoice Pricing? Employee Pricing? Tired of the gimmicks? Get the lowest price, the best customer service and HUGE selection every time at Walker Ford. Stop in today, we are conveniently located off US 19 in Clearwater, view the map for direction, and don't forget to check out our 5 star reviews while you're at it!